What is it about us that seems hell-bent on turning anything good into something bad? Words are wonderful, but they can be used to kill. Science progresses with techniques for curing and healing, but the same technology gets diverted into ways of killing ever more efficiently. Why? What is wrong with us? Well, none of this is new if you are remotely familiar with any Christian theology… or basic human experience. But, in relation to current news stories, I make two rather simply observations: first re the Jimmy Savile horror story, and second re racism in football. Various churches have had to pay heavily for allowing the systemic abuse of children and vulnerable people over decades. Quite right, too. Yet there has been a hint of a suspicion in some quarters that those doing the gloating about the nasty churches might one day need to defend themselves and their own institutions on similar terms. No schadenfreude here – just a fear that the problems experienced in the churches have less to do with the churches’ theology and more to do with common human propensities. The BBC is now under scrutiny and certain newspapers scream at the BBC in judgement – seemingly oblivious to the moral questions hanging over their own treatment of vulnerable people. The BBC faces serious scrutiny and it clearly needs it. For Savile to have been able to exploit its culture for so many decades raises serious questions that must be (and will be) addressed. But, those pointing the fingers now might need to be a little cautious in their judgements. They might be next. For the basic truth about all this stuff is that human beings have a tendency to turn goodness into badness, to exploit weakness and power, to put self-preservation before truth, and to pervert what began beautiful. This applies to the banks, businesses that pay no taxes, media organs that treat people like commodities for the entertainment of others, clergy who abuse trust and abase the ‘good news’ they are supposed to represent. As we keep having to remind those who uncritically (and sometimes mindlessly) accuse religion for all the world’s ills, the worst abuses of human life in the twentieth century came from anti-religionists such as Stalin, Hitler, Mao and Pol Pot. These are human problems, not just problems to be nailed to people we don’t like. In other words, this stuff goes right back to being human and not just part way to what humans say motivates them. This is another reason why people like me get fed up with accusations that Christians are escapists, whilst humanists are people who ‘take responsibility’ for themselves. Christianity is rooted firmly in this world, in facing reality and taking direct responsibility for the whole shebang. The cross of calvary involves God and us looking the sad reality of the human condition in the eye and naming it for what it is. No romantic escapism; no fantasising that if we just tried harder everything would be OK; no wishful thinking about ‘myths of progress’ that seem somehow to end up lying in pools of other people’s blood dripping from the altar of someone else’s tribal ego. This is where the racism stuff comes in. I am writing this while Liverpool are giving away a two-goal lead against Everton – football being the game that houses racism (leaving match fixing to cricket, doping to cycling and competitive-dadness to Monopoly). Yes, we must do all we can to expose racism wherever it comes to light. Yes, we must legislate against behaviours and language that represent a curse within our society, blighting lives and scarring all of us with sheer nastiness. But, no, we shouldn’t be surprised that these things go on and will not be eradicated by all our best efforts. As I once said to a neighbour in a General Synod debate on something or other: it is easy to win a vote – but winning the vote does not mean we have won the hearts and minds. 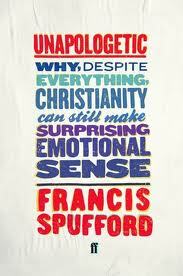 I read Francis Spufford's wonderful, funny, totally engaging and sweary Unapologetic – the best book on Christian faith I have read for ages. I read Joachim Gauck's little book on Freiheit: Ein Plädoyer (Freedom: A Plea). The recently-appointed President of Germany was a Lutheran pastor in East Germany (Angela Merkel was the daughter of another). I heard him speak a couple of years ago in Hannover and he was brilliant. Intelligent, reflective and passionate, I can't think of a UK equivalent. I listened (in the car) to Johann Sebastian Bach's gorgeous Weihnachtsoratorium – a 2-CD recording by the Thomanerchor from Leipzig which I bought at inflated price while visiting the Bachhaus in Eisenach a couple of weeks ago. Beautiful, inspiring and intricate, it takes you out of the present and into the eternal – Christmas being the irruption into history of the God who pours himself out for a world he loves infinitely. I listened (in the car) to Mumford & Sons' new album Babel – great contemporary folk music, but very similar to their excellent debut album Sigh No More. Whack up the volume when alone and stuck on the motorway. I listened (not in the car) to Bob Dylan's superb Tempest – as great as Modern Times and needing many re-listens. Let's hope it isn't – as rumoured – his last one. I wondered about the sheer moralistic envy of us Brits who insist that anyone in a position of responsibility be cut down to size. I have no time for Chancellor George Osborne or his 'something for nothing' millionaire Cabinet colleagues, but it is quite absurd to prevent MPs and ministers from travelling first class on the trains. I travel on trains a lot – always cattle class… apart from getting on the wrong part of a German train from Eisenach to Frankfurt and being told to enjoy first class by the conductor – and use the time to read papers, catch up on briefings, draft writings, etc.. I also know how hard it can be to concentrate and get stuff done if penned in. If I want ministers and MPs to do the best for their constituents, why would I not want them to travel well and perform well when doing what they were travelling to or for? I suspect the sneering is simply envy or our obsession with pulling people down. Liverpool won. At home. At last. Nuff said. I drove up to Ingleton to preach at an ecumenical service. Ingleton. Up in the Yorkshire Dales between the southern part of the Lake District to the north and the complex urban areas of Bradford and Keighley to the south. The sun shone, the sky was blue, the leaves gorgeously yellow-green-red-brown, the rivers sparklingly beautiful, the hills a reminder that they remain as we come and go.